As we have since July 2006, each Friday we’ll post our sampling of cigar news and other items of interest from the week. Below is our latest, which is the 559th in the series. 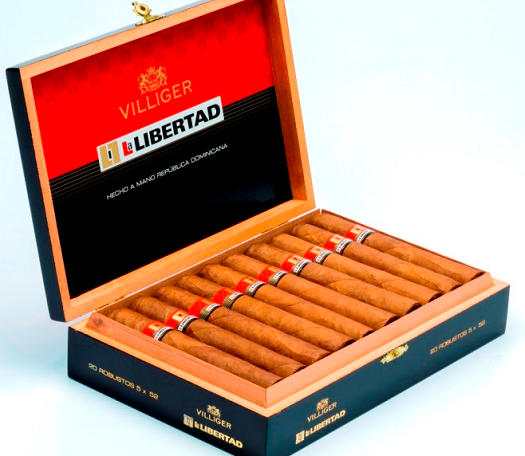 1) La Libertad from Villiger Cigars is getting a new look. “The Villiger La Libertad has a loyal following and has always been highly rated by consumers and media alike,” said Villiger North America President Rene Castañeda. “We felt that this brand needed a fresh new look, that was worthy of the cigar, as well as meeting the expectations of the consumer.” La Libertad comes in four sizes—Robusto, Torpedo, Churchill, and Masivo—and retails in the affordable $5.10 to $6.60 range. Handmade in the Dominican Republic, the cigar features a Brazilian wrapper around Dominican and Nicaraguan tobaccos. 2) Nicholas Melillo’s Foundation Cigar Co.—best known for its El Güegüense brand—has opened a cigar lounge outside Atlanta. This is the first Foundation-branded lounge. It is located within the Ligero Tobacco House in Buford, Georgia. Adam Tirado, owner of the shop, is a longtime friend of Melillo’s. The entire Foundation Cigar Co. portfolio, including its four branded coffees, is available at the shop. 3) Davidoff has named Dylan Austin vice president of sales and marketing in the U.S., effective January 1. Austin, 36, steps into this role from his current position as vice president of marketing. He will now lead the strategic and day-to-day oversight of the company’s sales organization and key account team. 4) Inside the Industry: Rich Cigars Inc., the DJ Khaled-promoted cigar company you likely never heard of, announced yesterday plans to end its cigar business to transform into a patent marketing and cryptocurrency mining company. 6) Deal of the Week: Here are 100 deals, including cigars from Ashton, Oliva, CAO, My Father, Tatuaje, Rocky Patel, Padrón, Drew Estate, and more. Free shipping is included on any purchase. If you really want to stock up, add promo code “GBP20D” at checkout to knock $20 off an order of $150 or more.